"All Aboard! 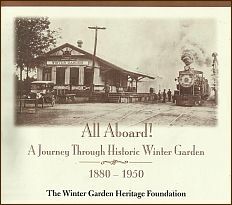 A Journey Through Historic Winter Garden"
by the Winter Garden Heritage Foundation. "A number of different stories about the origin of the name, Winter Garden, exist. According to one story, when A.B. Newton came to the area from Mississippi, he had tuberculosis and was not expected to live. His doctor recommended the move to Florida and, when the move proved to be beneficial to his health, he named the area after the prescribing physician, Dr. Gardiner. Another popular version of the name origin dates back to the 1880’s when several sawmill workers were having lunch. Workers spit tomato seeds on the ground. The seeds sprouted and grew well throughout the mild winter. When a good crop was produced from their lunchtime planting, they named the area around the mill Winter Garden. Still another version holds that a group of growers met for a picnic at Plant and Main Streets. They built a small railroad depot and needed a name for the stop. They came up with Winter Garden. Others claim David E. Washburn, a prominent owner of land on the western shores of Lake Apopka, named the city and still others claim that the name was created by Mrs. Frank Davis of Apopka. This book can be purchased at the Winter Garden Heritage Museum in downtown Winter Garden Florida.